They say that home is where the heart is. 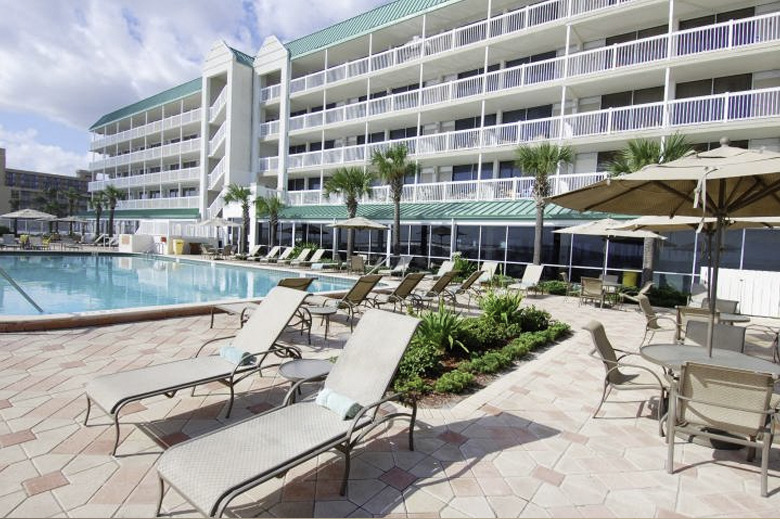 A stay at The Daytona Beach Resort during your next "Fun Coast" golf vacation may give you that comfort and wouldn't surprise us in the slightest if you remembered us forever. Located on the "World's Most Famous Beach" the resort is just 20 minutes from the airport and convenient to all the area's top golf courses. Fitted cheerfully with Beach-Inspired decor, our Ocean View Standard Room is a spacious and comfortable studio that will accommodate you nicely. From your room, enjoy great views of the beach and the Intercoastal Waterway. You will find your room's area space conveniently fitted for your sleeping, living and dining needs - including a mini-kitchen equipped with essential cooking utensils needed to prepare snacks and meals. After a day on the links, enjoy a relaxing swim in one of our four resort pools or a soak in a resort jacuzzi tub. Dine or have a beverage at Reflections - our oceanfront restaurant and lounge, or enjoy a light meal or cold beverage at The Reef Pool Bar (seasonal hours). And during your stay, take your golf vacation to the next level by spending an hour - or two, at the resort's Terra Acqua Spa to prepare for your golf days, or soothe away the post-round ailments! *Resort will be closed through 4/30/18.